The teen gave the examinations with the aid of a helper who wrote the answers as she dictated. Despite being declared ‘qualified’ in her mathematics paper, Insha will have to appear for it again as it was noted that ‘she needs to improve’. The news has spread joy in Kashmir. Insha’s father, Mushtaq Ahmad Lone, who was engaged as a driver with the state-run Motor Garages Department, started receiving congratulatory calls and messages soon after the results were declared and the news of Insha’s success began to spread online. “We are very happy today,” Lone tells The Wire, adding that Insha worked hard to memorise her lessons with the help of her teachers. Over the past year, Insha recorded the lessons she had with a home tutor, later listening to them again in order to memorise them. “Everyone supported her to continue her studies, including her teachers, classmates and our relatives,” says Lone. Soon after the news broke, social media congratulated her, with people sharing photos and calling her an inspiration for continuing to study despite the grievous pellet injuries she suffered. Insha was hit by pellets on the evening of July 11, 2016, three days after Hizbul Mujahideen commander Burhan Wani was killed when she opened a window to look outside her home in Sedow village of south Kashmir’s Shopian district. 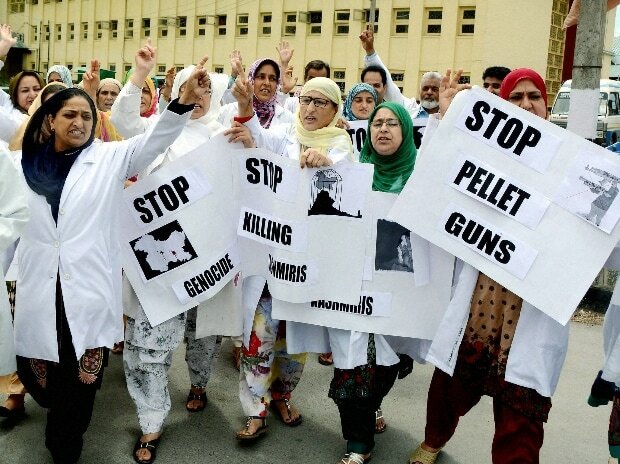 “I was at home when I was hit by hundreds of pellets, mostly on my face,” Insha was quoted as saying in an Amnesty International report titled “Losing Sight in Kashmir”, on the impact of pellet-firing guns. The report had also noted that many school and university students who had been hit in the eyes continue to have learning difficulties.